Keeping your investors, advisors, and partners in the loop is an important part of your job as a startup founder. When you have stakeholders scattered all across the U.S. (or the world), one of the easiest ways to do that is through regular email campaigns. But before you add this task to the bottom of your to-do list, we’ve compiled some easy tips and suggestions on design, content, and format to quickly get your latest news out to the people who are invested in the success of your company! The first question everyone asks me is whether they should send their stakeholder updates from their regular email service provider (i.e. Gmail, Outlook, Yahoo, etc.) or from an email marketing platform (MailChimp, Constant Contact, HubSpot, etc.). The truth is, both have costs and benefits. Ultimately, it’s up to you to decide how you want to communicate with your stakeholders — but I’m here to help you make an educated decision! 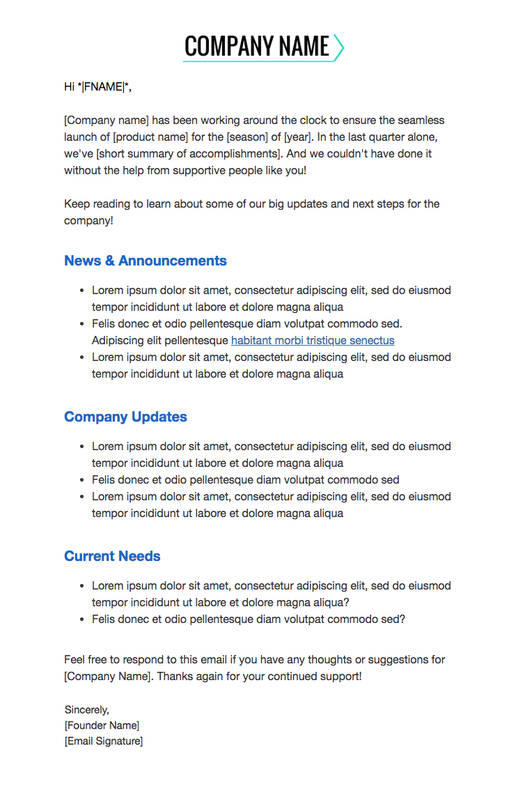 Regardless of how you choose to send your stakeholder update emails, make sure they’re easy to read. Use a friendly tone of voice and avoid industry jargon for the non-technical folks on your list. Headers, bolded text, and bullet points can help emphasize important information, but don’t use too much of a good thing. And if you choose not to use an email marketing platform, I don’t recommend including pictures because they can really throw off the formatting. The great part about stakeholder updates is that you don’t need to wow your recipients like you would if this were a consumer-facing email marketing campaign. You just need to deliver clear, concise information to people who are rooting for your success. Of course, you don’t want to make your message boring, but no fancy GIFs, complicated layouts, or clever headlines are needed here. If you’d like to be more descriptive or add some flare to the subject line, you should still indicate that it’s a routine update. But if you choose to stick to the basics, you’ll still want to change the copy each time you send it out — even if that’s just adding a volume/edition number, or month and year. Some email services will aggregate emails with the same subject line (regardless of content), which could make it hard for your recipients to find past emails. Plus, you don’t want anyone to mistakenly think you’re sending out the same email over and over again! Sending your email from an actual member of the team can be really powerful! Rather than using your generic company email address, choose one of the founders’ email addresses to send (or appear to send) the email from. And don’t forget to reflect that in the email signature as well! For the most part, you know each and every contact on your stakeholders list — so don’t write like a robot or treat them like a stranger. Begin each email with their name in the salutation (if you’re using an email marketing platform) and add a few inviting sentences that help set the tone for your updates. After that, you’ll want to think of a way to break up your emails to prevent big, overwhelming paragraphs. Use headings, bullet points, or dividing lines to separate individual announcements (you can scroll down for some layout examples). When possible, keep descriptions to a minimum, so that your busy stakeholders can see that you’re making progress and get to the most important part of the email sooner: your ask. Although it’s important to share updates with your stakeholders, one of the biggest benefits of sending out regular emails to your knowledgeable and well-connected advisors, mentors, and investors is that you’re creating more opportunities to engage with them and ask for help! Before you wrap up your email, think of one pressing issue that your company is facing and consider how one person on your list could potentially change it around. Maybe you need an introduction to a potential partner. Maybe you’re looking for some feedback on a pitch deck. Maybe you need a few more investors to meet your funding goal. Depending on where you’re at with your company, you might want a lot of help, but try to keep your requests to one single, powerful question. Be clear about your ask and offer some potential solutions that could make a difference. I know that sending out mass emails to a list of any size can feel intimidating. But I hope these tips will make the process run smoothly and help you keep your stakeholders informed! Feel free to leave a comment if you have any questions!